When WYSIWYG is turned off, all the behind-the-scenes code appears in the text. When it’s turned on, the code is translated and applied to the text, so the article displays as it would on the web. The WYSIWYG feature in the new Article Submission Form accurately displays all allowable tags. Turning the feature on will show any mistakes loud and clear. Limit HTML Styling – Limit any HTML styling to the most important points of each article. Use WYSIWYG to Check Code – Toggling the WYSIWYG feature on and off is a great way to check that the HTML is formatted correctly. Discover How to Use HTML with the WYSIWYG – If, as a beginner, you are interested in using HTML code to improve the appearance of your articles or other web content, use the WYSIWYG form. Remember these lessons when submitting your next quality, original article set. Also, leave a comment and let us know how you use HTML in your articles. *Note: The Article Submission Form will automatically convert any properly formatted URL in the Resource Box into a clickable link. HTML tags for linked URLs are recommended, but not necessary. This can happen to easy as its an un natural thing to be writing html, more pratice and patience can only help. Good luck Felix ! Great tips which are usually over looked Felix thanks. The term HTML sounds scarry to most of us that we dread attempting it, however, I want to think it’s a skill one should poses if you are serious about your internet business. You can’t afford to be lazy with it. Thanks for this good information on HTML. I always use WYSIWYG but will look at HTML from now on and see where I am able to improve. I haven’t been using this feature at all and Didn’t know I could add this to my articles Thanks again for all you do at EzineArticles. Your approval of my articles has really make my traffic to my site go up. I can;t thank you enough for all you do. Incredibly helpful; keeping up with e-marketing strategies is essential for writers, or for anyone who wants to generate both credibility and higher traffic. Thanks! Don’t think I’ll have much use for that. Thanks Felix for the tip. I didn’t know either that some html code could be used in our articles. I will certainly use this new knowledge under your guidelines. Question please Chris and/or crew? Can we use an article submitter to submit our articles to EzineArticles if we go back and check the editing/article? If so, is there one more than others that you prefer/recommend? I have a few articles to submit and doing it all one-by-one is quite daunting! You can use one if you would like. We don’t recommend them. Having control over your own article submissions is the best learning tool for you. I just don’t know why people hesitate to leave comment on other blogs. Read other blog content, it just polite to leave feed back about what you thought about the content to the blogger. he HTML tag we can use within the article. If we cite another article or use a quotation, can we use the html markup within the article body to give credit? Or does this have to go in the resource box in lieu of links back to the article author? I am not an expert on HTML codes so no problem so far for me. The useful archor text is a good method to introduce more information to your readers, however, many people add so many archors in his article or blogs, and the content did’t have a subject, that make people confused. Thanks for this good information on HTML..love it! I need to play for a while to get the hang of it. Finding the time is tricky….. I appreciate these training articles as they are short and to the point and written in layman language. Keep them coming. Thanks for the information. This was a reminder to me, for some reason I forget that I can use html in the article. 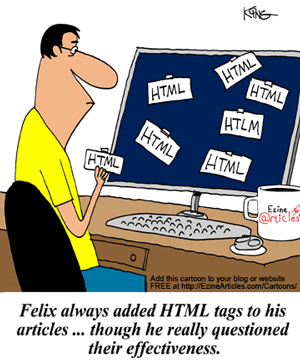 There are many resources available if you don’t know much about html online. Just use your search engine. It can really add emphasis to your articles when used appropriately, but like Felix says, don’t overdo it.